The HWUN4 improves your wireless strength for a stable, uninterrupted wireless connection. Most Wi-Fi-enabled computers inherently have minimal wireless coverage due to the fixed placement of the internal low gain antenna. This results in slow and unstable connections, or even no connection at all. The HWUN4 External Wireless Network Adapter improves your wireless strength for a stable and uninterrupted wireless connection. The HWUN4 is engineered with a High-Gain 3dBi antenna to improve your wireless connection. The slim casing and rotating hinge provide maximum compatibility for different types of USB port placements (vertical, horizontal, front, or back). The rotating hinge feature also lets you adjust the antenna position as needed to obtain the best wireless signal. The two internal antennas work simultaneously to optimize your Wi-Fi performance by enhancing your Wi-Fi sensitivity, increasing the receiving distance, and boosting overall performance. The HWUN4 plugs directly into your USB port to increase your overall wireless performance by up to 300%. It supports Wi-Fi Protected Setup (WPS) with a hardware button for easy connection. Simply run the setup wizard on the included disc, and you're ready to plug in and go. It's the easiest way to increase wireless performance in areas where your home router may not have a clear signal, or in university or office buildings that may block or reduce the wireless signal. The HWUN4 is compatible with Windows and Mac PCs, as well as most laptops, to greatly increase your wireless reception. 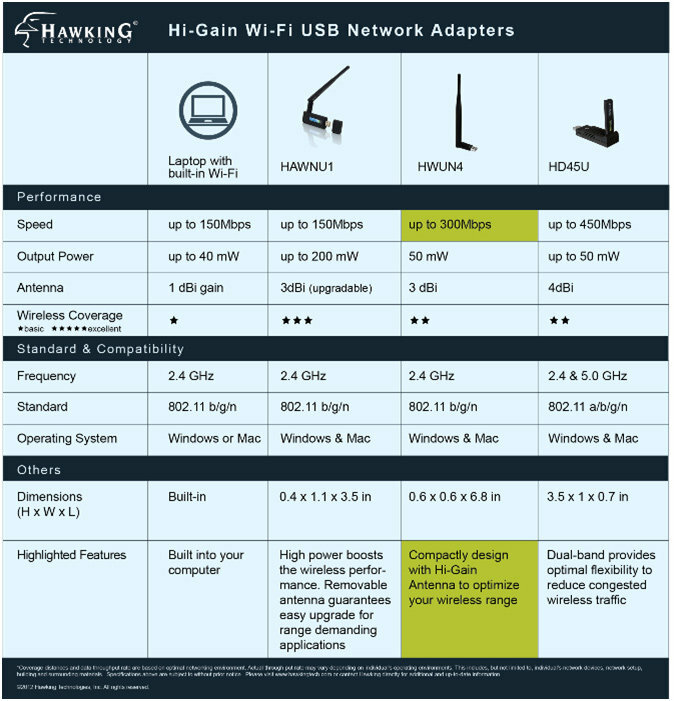 Hawking Hi-Gain Wireless-300N USB Adapter, Quick Installation Guide (for Windows and Mac), Setup CD (includes User Manual). Need a reliable wireless connection for your laptop/desktop? The HWUN4 USB Wireless-300 Network Adapter, connects your Mac or Windows system to a wireless network at up to 300Mbps. The HWUN4 USB Network Adapter is engineered with high performance antenna technology. The two internal antennas work simultaneously to optimize your WiFi performance by enhancing the WiFi sensitivity, increasing the receiving distance, and boosting overall performance. The slim design provides ultimate mobility and flexibility for most laptops or desktops, while the powerful external antenna and its rotating hinge can be adjusted to obtain the best signal strength.